Hero cults were one of the most distinctive features of ancient Greek religion. Hero cults were one of the most distinctive features of ancient Greek religion. In Homeric Greek, “hero” (ἥρως, hḗrōs) refers to a man who fought (on either side) during the Trojan War. By the historical period, however, the word came to mean specifically a dead man, venerated and propitiated at his tomb or at a designated shrine, because his fame during life or his unusual manner of death gave him power to support and protect the living. A hero was more than human but less than a god, and various kinds of supernatural figures came to be assimilated to the class of heroes; the distinction between a hero and a god was less than certain, especially in the case of Heracles, the most prominent, but atypical hero. The grand ruins and tumuli remaining from the Bronze Age gave the pre-literate Greeks of the 10th and 9th centuries BC a sense of a grand and vanished age; they reflected this in the oral epic tradition, which would crystallize in the Iliad. Copious renewed offerings begin to be represented, after a hiatus, at sites like Lefkandi, even though the names of the grandly buried dead were hardly remembered. “Stories began to be told to individuate the persons who were now believed to be buried in these old and imposing sites”, observes Robin Lane Fox. Greek hero-cults were distinct from the clan-based ancestor worship from which they developed, in that as the polis evolved, they became a civic rather than familial affair, and in many cases none of the worshipers traced their descent back to the hero any longer: no shrine to a hero can be traced unbroken from Mycenaean times. 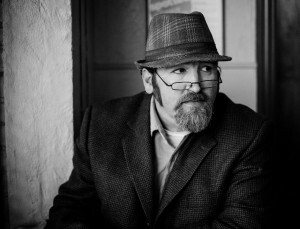 Whereas the ancestor was purely local, Lewis Farnell observed, the hero might be tended in more than one locality, and he deduced that hero-cult was more deeply influenced from the epic tradition, that “suggested many a name to forgotten graves”, and provided even Dorians a connection to Mycenaean heroes, according to Coldstream. “Coldstream believed the currency of epic would account for votives in Dorian areas, where an alien, immigrant population might otherwise be expected to show no particular reverence for Mycenaean predecessors”. Large Mycenaean tholos tombs that betokened a grander past, were often the site of hero-cults. Not all heroes were even known by names. Aside from the epic tradition, which featured the heroes alive and in action rather than as objects of cultus, the earliest written reference to hero-cult is attributed to Dracon, the Athenian lawgiver of the late seventh century BC, who prescribed that gods and local heroes should both be honoured according to ancestral custom. The custom, then, was already established, and there were multiple local heroes. The written sources emphasise the importance of heroes’ tombs and the temenos or sanctuary, where chthonic rites appeased their spirits and induced them to continue to favour the people who looked to them as founders, of whom founding myths were related. In the hero’s restricted and local scope he “retained the limited and partisan interests of his mortal life. He would help those who lived in the vicinity of his tomb or who belonged to the tribe of which he himself was the founder,” observes Robert Parker, with the reservation that Heracles, with his pan-Hellenic scope was again the exception. Whitley interpreted the final stage, in which hero-cult was co-opted by the city-state as a political gesture, in the archaic aristocratic tumulus surrounded by stelae, erected by Athens to the cremated citizen-heroes of Marathon (490 BC), to whom chthonic cult was dedicated, as the offering trenches indicate. On the other hand, Greek heroes were distinct from the Roman cult of dead emperors, because the hero was not thought of as having ascended to Olympus or become a god: he was beneath the earth, and his power purely local. 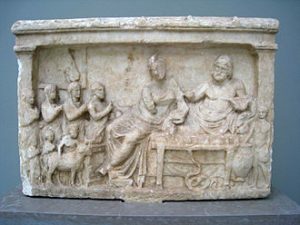 For this reason hero cults were chthonic in nature, and their rituals more closely resembled those for Hecate and Persephone than those for Zeus and Apollo: libations in the dark hours, sacrifices that were not shared by the living. The two exceptions to the above were Heracles and Asclepius, who might be honored as either heroes or gods, with chthonic libation or with burnt sacrifice. Heroes in cult behaved very differently from heroes in myth. They might appear indifferently as men or as snakes, and they seldom appeared unless angered. A Pythagorean saying advises not to eat food that has fallen on the floor, because “it belongs to the heroes”. Heroes if ignored or left unappeased could turn malicious: in a fragmentary play by Aristophanes, a chorus of anonymous heroes describe themselves as senders of lice, fever and boils. 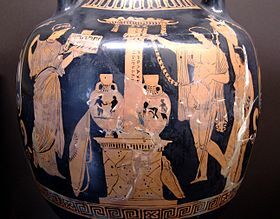 Some of the earliest hero and heroine cults well attested by archaeological evidence in mainland Greece include the Menelaion dedicated to Menelaus and Helen at Therapne near Sparta, a shrine at Mycenae dedicated to Agamemnon and Cassandra, another at Amyklai dedicated to Alexandra, and another in Ithaca’s Polis Bay dedicated to Odysseus. These all seem to date to the 8th century BC. The cult of Pelops at Olympia dates from the Archaic period. Penelope became a moral heroine for later generations, the embodiment of goodness and chastity, to be contrasted with the faithless, murdering Clytaemnestra, Agamemnon’s wife; but ‘hero’ has no feminine gender in the age of heroes. 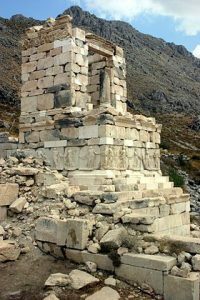 Where local cult venerated figures such as the sacrificial virgin Iphigeneia, an archaic local nymphe has been reduced to a mortal figure of legend. Other isolated female figures represented priestess-initiators of a local cult. Iconographic and epigraphal evidence marshalled by Larson combine to depict heroines as similar in kind to heroes, but in androcentric Greek culture, typically of lesser stature. Oikist cults of founders. Such cults arose in colonies in the Hellenic world in Magna Graecia and Sicily at the grave of the founder, the oikist. In the case of cults at the tombs of the recently heroised, it must be assumed that the identity of the occupant of the tomb was unequivocally known. Thucydides (V.11.1) gives the example of Brasidas at Amphipolis. Battus of Cyrene might also be mentioned. “Such historical examples,” Whitley warns, “have clearly colored the interpretation of certain tomb cults in the Archaic period.” Such Archaic sites as the “heroon” at Lefkandi and that close to the West Gate at Eretria cannot be distinguished by archaeological methods from family observances at tombs (tomb cults) and the cult of ancestors. Cults to named heroes. 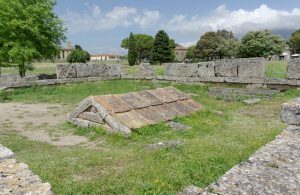 A number of cult sites known in Classical times were dedicated to known heroes in the Greek and modern senses, especially of the Iliad and other episodes of the Epic Cycle. Whitley makes two points here, first that the earliest heria associate the male hero with earlier and stronger female presences, and second, that figures such as Odysseus, Agamemnon and Menelaus all have strong local connections. The cults of Oedipus at Athens and Pelops at Olympia are examples. Cults to local heroes. Such local figures do not figure among the Panhellenic figures of epic. Examples would be Akademos and Erechtheus at Athens. Cults at Bronze Age tombs. These are represented archaeologically by Iron Age deposits in Mycenaean tombs, not easily interpreted. Because of the gap in time between the Bronze Age collapse and the earliest votive objects, continuity appears to be broken. A sherd from above the Grave Circle A at Mycenae is simply inscribed “to the hero”, and Whitley suggests that the unnamed race of the Silver Age might have been invoked. In Attica, such cults are those associated with tholos tombs at Thorikos and Menidhi. Oracular hero cults. Whitley does not address this group of local cults where an oracle developed, as in the case of Amphiaraus, who was swallowed up by a gaping crack in the earth. Minor cults accrued to some figures who died violent or unusual deaths, as in the case of the dead from the Battle of Marathon, and those struck by lightning, as in several attested cases in Magna Graecia. Hero cults could be of the utmost political importance. When Cleisthenes divided the Athenians into new demes for voting, he consulted Delphi on what heroes he should name each division after. According to Herodotus, the Spartans attributed their conquest of Arcadia to their theft of the bones of Orestes from the Arcadian town of Tegea. Heroes in myth often had close but conflicted relationships with the gods. Thus Heracles’s name means “the glory of Hera”, even though he was tormented all his life by the queen of the gods. This was even truer in their cult appearances. Perhaps the most striking example is the Athenian king Erechtheus, whom Poseidon killed for choosing Athena over him as the city’s patron god. When the Athenians worshiped Erechtheus on the Acropolis, they invoked him as Poseidon Erechtheus. Parker gives a concise and clear synopsis of hero. Parker, Robert (2001) . “Greek Religion”. In Boardman, John; Griffin, Jasper; Murray, Oswyn. The Oxford History of Greece and the Hellenistic World. Oxford: Oxford University Press. Retrieved 17 November 2018. The term ‘hero’ had a technical sense in Greek religion: a hero was a figure less powerful than a god, to whom cult was paid. He was normally conceived as a mortal who had died, and the typical site of such a cult was a tomb. But various kinds of minor supernatural figure came to be assimilated to the class and, as in the case of Heracles, the distinction between a hero and a god could be uncertain. Carla Maria Antonaccio, An Archaeology of Ancestors: Tomb Cult and Hero Cult in Early Greece (1995) and “Lefkandi and Homer”, in O. Anderson and M. Dickie, Homer’s World: Fiction, Tradition and Reality (1995); I. Morris, “Tomb cult and the Greek Renaissance” Antiquity 62 (1988:750-61). Robin Lane Fox, Travelling Heroes: Greeks and their myths in the epic age of Homer. Stories began to be told to individuate the persons who were now believed to be buried in these old and imposing sites. “The cult of Heroes everywhere has the same features as the cult of ancestors… the remains of a true cult of ancestors provided the model and were the real starting-point for the later belief and cult of Heroes.” Rohde 1925:125. Coldstream, “Hero cults in the age of Homer”, Journal of the Hellenic Society 96 (1976:8-17). R. K. Hack, “Homer and the cult of heroes”, Transactions of the American Philological Association 60 (1929::57-74). Carla M. Antonaccio, “Contesting the Past: Hero Cult, Tomb Cult, and Epic in Early Greece” American Journal of Archaeology 98.3 (July 1994:389-410). Inscriptions reveal that offerings were still being made to the heroised dead in the first century BC; the tumulus is discussed in Whitley, “The Monuments that stood before Marathon: Tomb cult and hero cult in Archaic Attica” American Journal of Archaeology 98.2 (April 1994:213-230). In the case of the shrine to Odysseus, this is based on a single graffito from the Hellenistic period. Jennifer Lynn Larson, Greek Heroine Cults (University of Wisconsin Press) 1995, has marshalled the evidence. Finley, The World of Odysseus (1954; rev. ed. 1978), p.32f. “Heroine cults fit well into our modern view of ancient Greek culture as firmly androcentric, though not as androcentric as some would have had us believe” (Larson 1995:144). A general study of oikist cults is I. Malkin, Religion and Colonization in Ancient Greece (Leiden) 1987:189-266. Lewis R. Farnell, Greek Hero-Cults and Ideas of Immortality (Oxford), 1921. E. Kearns, The Heroes of Attica (BICS supplement 57) London, 1989. Gregory Nagy, The Best of the Achaeans: Concepts of the Hero in Archaic Greek Poetry, 1979. Jennifer Larson, Ancient Greek Cults: A Guide (2007). Routledge. This entry was posted in Ancient, Greece, Greek, History, Mythology, Religion. Bookmark the permalink.